Modern valves are built to last, says VPS Founder and MD Steve Pearson – and they will last even longer if you take some simple steps to prolong their life. Follow Steve’s advice so your valves give you longer service: looking after them is better for business resilience, productivity and results. 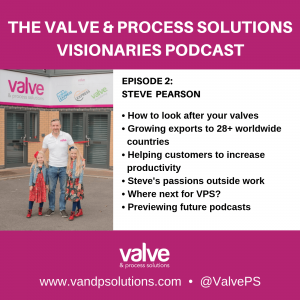 In episode two of the Valve & Process Solutions Visionaries Podcast, Steve also explains how VPS has moved from zero exports 18 months ago to exporting to 28+ countries today. He describes some of the values behind the business, why a recognised qualification will be good for the industry and previews other podcasts in this series. You can listen to episode one of the podcast, featuring Mick Pepper, here.